The dynamics of people working with each other is complex. Humans have been relating for many thousands of years and through special talents we humans have like; empathy; the ability to reconcile; the ability to work cooperatively; understanding the reciprocity of relationships; and having the capacity to forgive; we’ve done a darn good job getting to where we are today. All of the five core capacities listed above help us work in teams at a level that is creative, productive, and brilliantly intelligent. This area of strong relationships and extreme idea exchange is called the Creative Tension Zone. Teams fall out of the Creative Tension Zone for a variety of reasons. This blog post won’t discuss those reasons or how to navigate them but is instead intended to help you build a greater awareness around the idea that tension can tip into conflict and is predictable. I believe that in any part of our businesses, being as aware as possible of what is happening all around us, in real time, is the key to making good decisions and staying in high growth mode. The last post talked about warning signs that conflict is brewing. Here I’ll broaden that view a little by talking about the Conflict Curve. It’s fascinating! When I first saw a diagram like this, it was in a class designed to help mediators understand the big picture of how and when different types of intervention can be applied to help people resolve conflicts (the full drawing below shows points where everything from trainers, to facilitators, to mediators, to lawyers and judges, to police, to military can be injected into the situation). The concept hit me like a ton of bricks for two reasons; One was because it simplified conflicts I had been in myself in the past and gave them some context in the bigger world of human interaction; and two, the conflict curve can be applied to any and all conflicts from a neighbor’s barking dog dispute to a war between two countries. Take a moment to look at the various points on the curve. 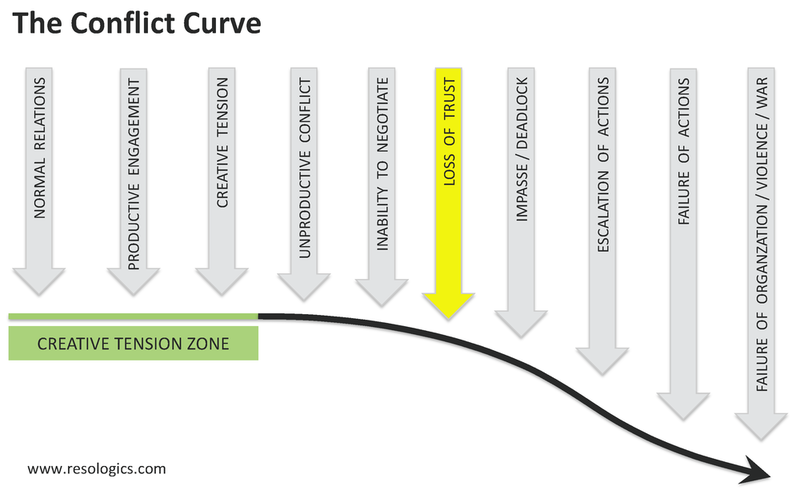 Can you relate any of the conflicts you have encountered in your life to various points along the curve? Think about the relationships you are in now and where they are riding on the curve. Practice the skill of conflict curve awareness by pulling a story from a news post and trying to identify where the conflict sits on the curve. What do you notice? The key awareness/theory here is that the further along the downward slope of the curve you find yourself, the harder it is to return to normal productive relations and the more management time it takes to deal with all the crap that goes along with being low on the curve. Simple right? Not so much so when you are in the middle of a disagreement with a co-worker or investor, or members of your team are, and everyone is determined to hold their ground. For an outsider coming in to help people with an in progress conflict, like a mediator, one of our key discoveries is to see if and how far beyond the “Loss of Trust” stage the relationship(s) has gone. Once trust is lost, it becomes harder and harder to recover the relationship and resolve the conflict in a way that is good and productive to everyone. For leaders of high potential startups it is a critical skill to be able to identify where individuals, and the team as a whole, are on the curve. Each manager will need to find unique entry points to manage the conflicts in their own way. Make no mistake, one must manage it or it will manage you. Understanding that there is a conflict curve with a variety of entry points is the first step. Seeing them in real time is a skill worth practicing and mastering. Next time, let’s dive into the Conflict Spiral, another awareness tool I hope you will find useful with your team.